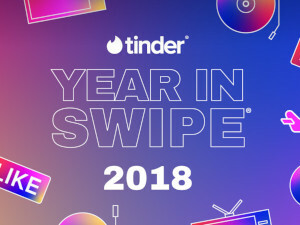 Tinder released a new report[*1] this December called “Year in Swipe,” where the popular dating app revealed the best time to log into the app and other insights to help improve your dating game. Searching through its troves of data to find interesting trends among users, Tinder found that the best day to be on the app is Monday. The best time is also in the evening – 6:00pm for those in California and the West Coast, and 9:00pm for East Coast residents. The study noted that August was the best month of the year for activity, but any Monday night you’re likely to see a spike in users, so it’s good to take advantage and log in. Tinder examined other high-traffic times on the app, noting specific events over the past year where more people were swiping and logging in. Big surprise - the Superbowl turned out to be the most popular event of the year for Tinder as well as American football fans. Music festivals were also a very popular time for users to log in. 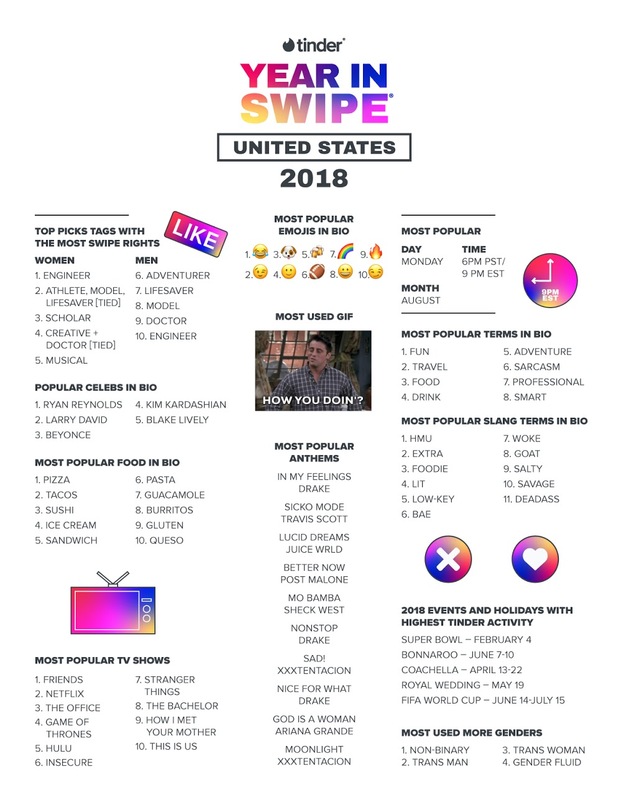 Bonnaroo, which took place in June, was the second most popular swiping event. Celebrity-studded Coachella music festival came in third, with people logging in over a period of ten days while the festival was in process. As it turned out, royal weddings were also a romantic draw, with Prince Harry and Meghan Markle’s wedding being the fourth busiest time in 2018 to swipe. The FIFA World Cup was also a huge draw, including for US daters. These findings provided a little more insight into online dating then the annual Singles in America study conducted by parent company Match Group. For several years, the company found that most people are swiping on dating apps from New Years to Valentines’ Day, with the rest of the year being a little less active. While this period is still dating’s high season, Tinder’s study reveals that specific events can also be a huge draw for daters, and it benefits dating apps users to log in at these times for better luck in matching. Entertainment events are a bit of an aphrodisiac, it turns out. Not to mention, Mondays don’t have to be just the dreaded start of the work week anymore – they can also be the best time to log in and land a date. So if you’re wondering why you’re not getting results from swiping, consider making time to swipe on Monday night. For more on this dating app you can read our Tinder review.